Spacious room with Queen bed and double sofa bed or queen bed and 2 single beds, fully self- contained with cooking utensils and crockery. Austar TV, private balcony or patio. Breakfast menu available with room service. Cot available at no charge. 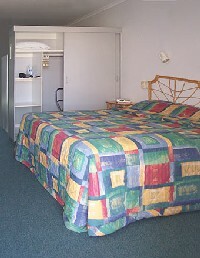 Spacious room with Queen size bed, fully self-contained kitchenette, Austar TV, private balcony or patio. Upstairs units have ocean views. Breakfast service available delivered to your room.